all shown in my Review! PLEASE READ MY RULES CAREFULLY!! 1. Must be a Follower(through google friend connect) OR a Subscriber of my blog. 3. Leave me a comment saying "PiinkCupcakez.com is the best!" 4. Include your NAME and EMAIL! 1. Follow me on Twitter and Retweet this.. "RT @piinkcupcakez Get great nails! 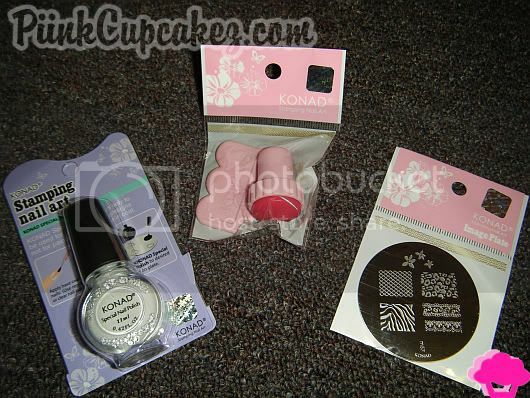 Win a Konad Stamping Nail Art Kit @ www.PiinkCupcakez.com"
3. Blog about this giveaway or post it on your sidebar. p.s. i follow you on twitter, subscribed, liked your blog on facebook. & retweeted! did i mention i lovee your blog? And the giveaway is on my sidebar! PiinkCupcakez.com is better than anything! I live PiinkCupcakez.com because it incorporates my favorite two things - great makeup and adorable deserts! My email is chanelle.dance4god@gmail.com and my name is Chanelle! But ı am living in turkey. OooOo lovely! I have been wanting to try Konad forever now! Now that my nails are actually growing, this would be great! i am deff a follower. Am a brand new follower of your awesome blog! I NEED Konad in my life! I hope I win!! I "like" your blog's page on Facebook, I'm Carmen Cánovas Jiménez. I say PiinkCupcakez.com is looovvee..
PiinkCupcakez.com is the best! LOL! My e-mail address is: kategeneblog [at] gmail [dot] com.